Apo-Prednisone (Prednisone) is a synthetic glucocorticoid with strong anti-inflammatory properties. It works by reducing inflammation and affecting the immune response. Apo-Prednisone (Prednisone) is a synthetic glucocorticoid with strong anti-inflammatory properties. It works by reducing inflammation and affecting the immune response. This medicine has a wide range of medical uses, one of which included being used to treat adrenocortical deficiency. By replacing the body's levels of corticosteroid hormones, it can help to treat this condition. Other disorders of the organ systems in the body can be treated with its anti-inflammatory effects, and it is also widely used for the different forms of arthritis so as to provide relief from the pain and stiffness that can affect the joints in patients suffering from this condition. It has also found use in the treatment of asthma, dermatitis, eye disorders, skin conditions, cancer as well as various disorders not listed here. Medical experts have theorized that its immunosuppressant and anti-inflammatory effects may be due to it blocking cell activation and preventing the release of cellular mediators of inflammation (substances which can cause swelling and play a vital role in immunological conditions). 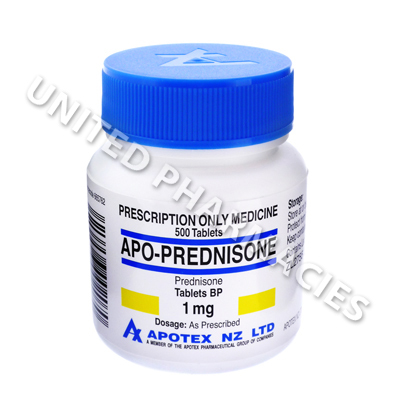 Apo-Prednisone (Prednisone) is provided as 1mg strength tablets which are taken via the oral route. The dosage may vary greatly from patient to patient depending on the condition that needs to be treated, and your doctor will carefully consider all of the factors relating to your condition when calculating your dosage, so that the correct amount can be decided upon. Changes to the dosage schedule may also be needed. Always comply with the directions of your doctor. You will be required to promptly inform the doctor in charge of providing medical care if any side effects occur. Some potential side effects may be of a serious nature and will require immediate medical attention. Go to your doctor (or the hospital) straight away if you are affected by muscle twitching, a dry cough, unusual increases in your weight, numbness, sore or red eyes and any other serious reaction that has not been mentioned in this paragraph. This medicine has been known to trigger an increase in the blood levels of glucose (sugar). If you are diabetic, your doctor will need to take this under consideration, and alterations to your required dosage of diabetic medicine may be needed. Regular visits to your doctor may be necessary during treatment, so that your blood pressure can be checked. Blood tests may also be required.